South Caucasus: Everyone Likes Russians? 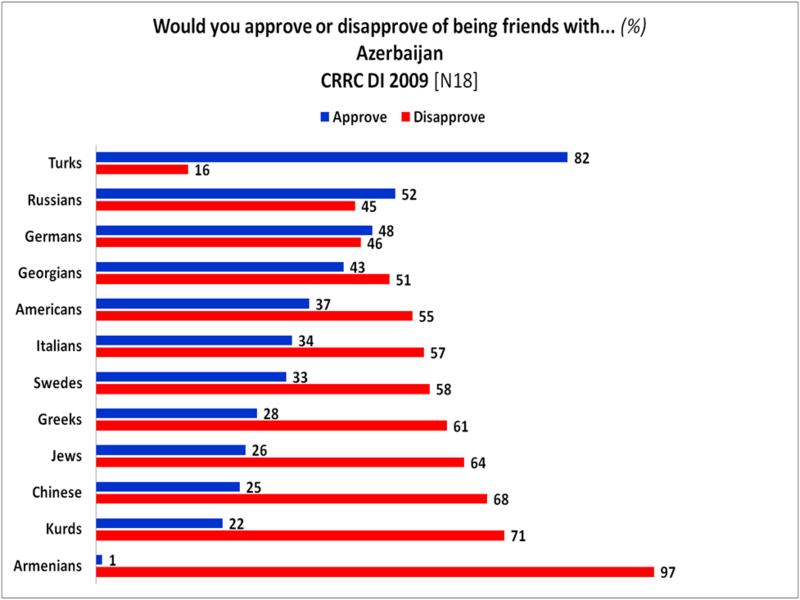 The CRRC have published the results of their “2009 Caucasus Barometer” survey, which polled respondents in all three Caucasus countries about whether they approve of friendship with various other nationalities. “Of the three countries, Georgians are the most accepting of friendship with other ethnicities of the three countries, with an overwhelming majority of respondents approving of friendship with every nationality, Italians and Greeks scoring the highest at 83%, followed closely by Americans, at 82%,” the CRRC blog writes. The figures the survey showed for Armenia and Azerbaijan weren’t surprising at all, given the conflict those two nations have with each other. 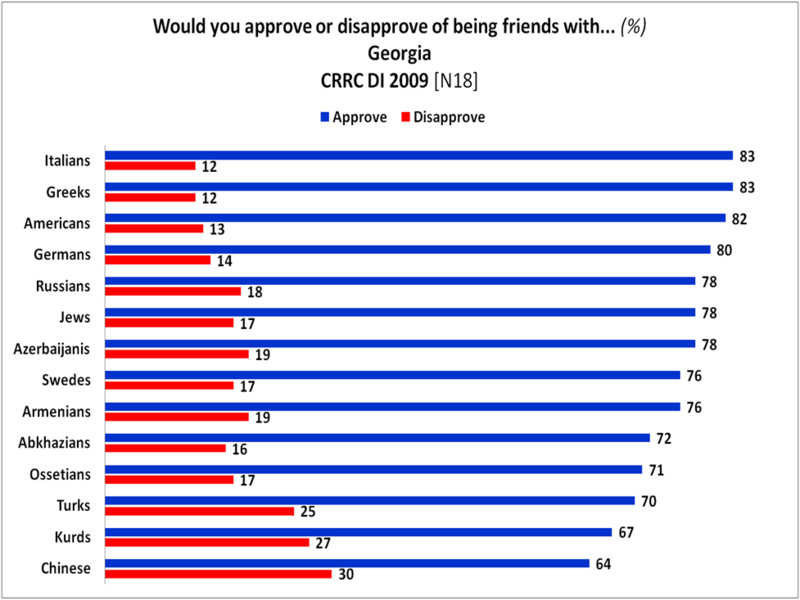 What struck me as surprising was Georgia with its 78% of approval rate for friendship with Russians. It is amazing, because of the August 2008 Georgia – Russian war over South Ossetia and yet, only 1 year from that, no hatred. Surely, Armenians and Azerbaijanis have important lessons to learn from our common northern neighbor. This entry was posted in Armenia, Region, Society and tagged Armenia, Azerbaijan, Caucasus, Georgia, Georgians, Russians, South Ossetia, United States by Observer. Bookmark the permalink. not me, I hate those ruskies muskies. putin has enslaved our homeland since the beginning of his tenure. Although, I have to accept this due to the fact that if ruskies are not involved in our affairs, those scummy turks & azeris would have obliterated our Hayastan long time ago. So, I thank ruskies for helping us, but they did it for their selfish interests, not for ours. Also, I hate anyone who has been an enemy of us in small or large capacity at one time or another and/or is occupying our original lands. This includes persians. They can pretend that they love us all they want and say….”areh khoreh joreh moreh you Ermeni is our cousins”….but that doesn’t change the fact that they tried to delete our identity via assimilation not once, but few times, up-rooted our Jughacis in 1600’s, and ruled us several times before that. I swear, it’s as if Armenians have been bullied the most on this planet by all empires. We never bullied anyone, we never genocided anyone, we never occupied anyone. Why can’t others leave us alone in peace so that we can make ourselves big and succeed in this world. Andranik jan – is there anyone you like/don’t hate? :))) e.g. I really like Italians, Americans, French… ;) Who do you like? I love the French, the people, their culture, their language, especially because we have close ties with them and they help us as much as they can or are allowed by the zionists . Also, I love Japanese, their foods, their honor system, their seriousness and zest for life. I would enjoy to live in Tokyo for 1-2 years. I consider Japanese to be Armenians of east asian world, their culture & traits are not that much disimilar from ours. I like Italians, but I LOVE the Greeks….OPAAA’ !!! Already Greeks are close to us in blood and culture, our Armenak tribe decended from Greeks (Thracians & Phrygians) I would love to live in Greece and own a home there. Although, I wish the Greeks would visit Hayastan and back us more often, but they bow down to turks …very sad. Also, I like Spanish too, I would like to hang out in Barcelona for few months. I like alot of others, but anyone who has pissed on us Hays…of course I will hate them. If I piss on you and your family, would you love me for it? Andranik, I graduated high school in California, visited the US a couple of times after that, believe me, I know very well what America is like. I was aware you had visited here, but I did not know you attended schooling here. I can assume you resided in glendale and went to glendale or hoover high? Also, why did you leave? Also, I would like to comment on inquisitorial’s comment about her loving the ruskies. After exchanging few words with her finding out that she prefers to live in east coast (where FAKE Armenian communities are very ANTI-Hayastanci over there) and she told me that she would not want to live in LA and/or be near Armenians and has no contact with any REAL Armenians near her, I find her comment about loving otars in general to be very ANTI-Armenism, it seems to me she is not very PRO-Hay and could be a self-hating Armenian altogether. If you dont like us so much, then why bother to even read our blogs, post comments, how about you strip yourself of your Haykakan inqnutyun as the FAKES have done and go join them, maybe you would fit in very easy?…I don’t know, but impression I receive from her is that she doesn’t want to be near us as if we are “very bad” for her or something of the such. ba du gites ! Yes, I think it would be very funny tha everyone likes German, for example, I don’t like them. Maybe the headline “Georgians like Russians” would be better. I think so. It’s strange to see that people may or may not like others solely based on their ethnic origin (or nationality in case of the Americans). In any case, Azerbaijan doesn’t seem to be a good place to be. Why not?? We and Russians lived and shared world for 70 years while being part of a Soviet Union! I like Russians, I also speak/write/read in Russian. I think it is another heritage that I bequeath in my life. And it is a good thing! @Observer – how many years you lived here? would you have stayed? or you went because your visa expired? please excuse me, I’m trying to understand why you did’nt stay or could not stay…I dont’ know !